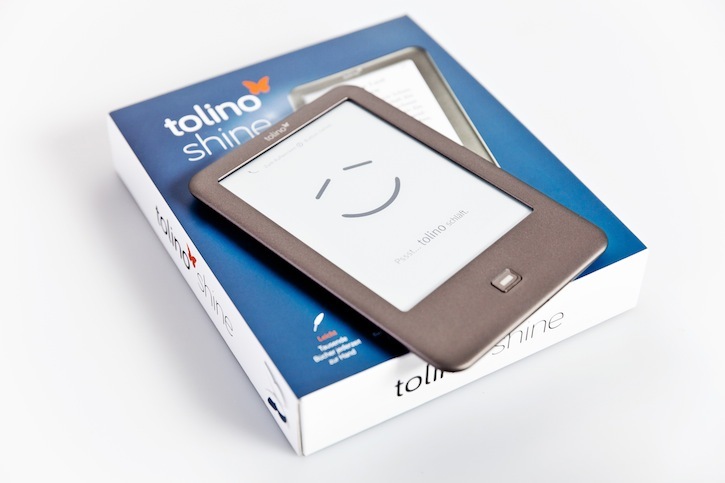 Earlier today, three booksellers — Thalia’s Michael Busch, Weltbild’s Carel Halff and Hugendubel’s Nina Hugendubel — as well as Club Bertelsmann Program Director Anita Offel-Grohmann and Thomas Kiessling, CIO of Deutsche Telekom — announced the launch of the new Tolino ebook platform. This brings together Germany’s top physical booksellers, its largest media company and largest telecom company in direct competition with Amazon and Apple, as well as other indigenous services. The cloud-based platform launches with some 300,000 titles, as well as a proprietary device — the Tolino Shine — a 6-inch backlit e-ink device that will go on sale March 7th for € 99.99. More devices are expected to roll out in the coming months. Overall, the device should be available at some 1,500 physical branches, as well as 11,000 Telekom “HotSpots” throughout the country. Buchreport offers an interview with Weltbild’s Carel Halff and Hugendubel’s Nina Hugendubel on why the competitors chose to collaborate. “We need to be more to be more vehement in the marketplace to pose a real alternative to the North American competition,” said Hugendubel. The booksellers, fierce competitors, will remain so and will not share any proprietary information, say the execs, largely to avoid any anti-competitive legal issues.